Whangamata Vistas B&B offers a choice of 2 studio rooms quietly nestled amongst native bush and tropical plantings. Overlooking the Whangamata Marina, harbour and out to the beautiful Pacific Ocean and its offshore islands this is the perfect place to rest and relax or as a base to explore the Coromandel. As one of our guest said "this place is too lovely not to be shared". Your hosts Terry & Laureen will make you very welcome. With a lovely indoor/outdoor flow onto generous decking space the Island View Room offers more than the average B&B. The studio room has a comfortable queen size bed with a separate en-suite and walk in shower. Attractively furnished with Pacific Palm furniture it also has a convection microwave, tea & coffee making facilities, good sized kitchenette with gas hobs, BBQ and outdoor furniture just for your use. Free WIFI in your room with flat screen TV. A continental breakfast basket of seasonal fruit salad, homemade yogurt, cereals, juice, breads to toast and condiments is delivered to your room in the evening for you to enjoy at your leisure. You dont even have to leave your room to enjoy the panoramic view of the Whangamata harbour, MoanuAnuAnu Estuary and the beautiful Pacific Ocean. With a lovely indoor/outdoor flow onto the decking the Marina View Room offers more than the average B&B. The studio room has a comfortable queen size bed with a separate en-suite and walk in shower. Attractively furnished with Pacific Palm furniture it also has a microwave, tea & coffee making facilities, kitchenette, BBQ and outdoor furniture just for your use. Free WIFI in your room with flat screen TV. A continental breakfast basket of seasonal fruit salad, homemade yogurt, cereals, juice, breads to toast and condiments is delivered to your room in the evening for you to enjoy at your leisure. 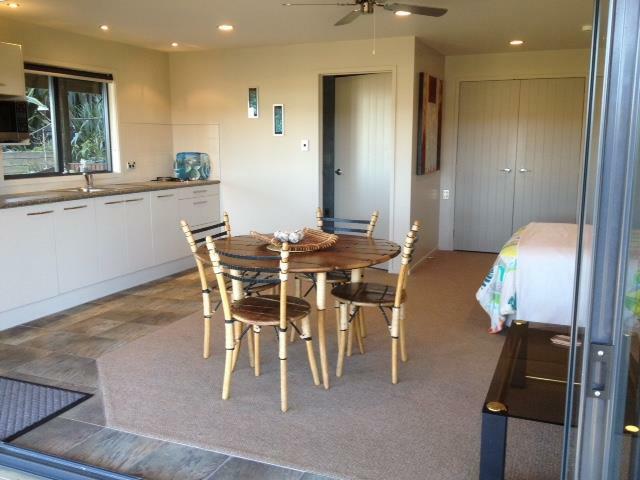 Enjoy the view of the Whangamata harbour, marina and MoanuAnuAnu estuary without even leaving the bed.